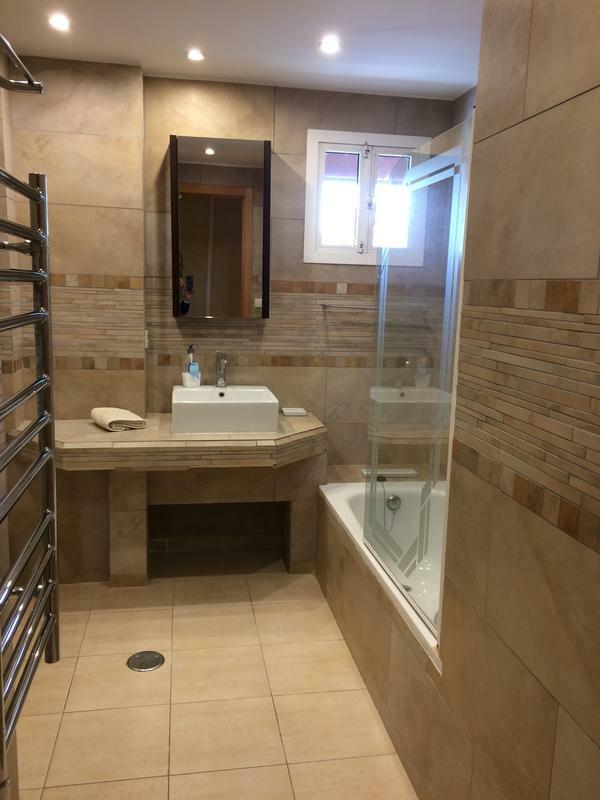 Casa Sam is a three bedroom and two bathroom apartment situated in the heart of Marbella’s town yet right by the beach and promenade. There is also a lovely park next door and many shops, bars, restaurants and café’s all around the building. 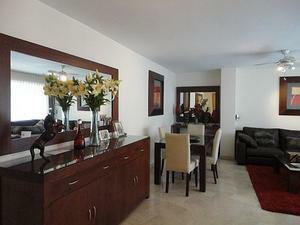 Parque Marbella is a hugely popular complex and this apartment is refurbished to high standard. 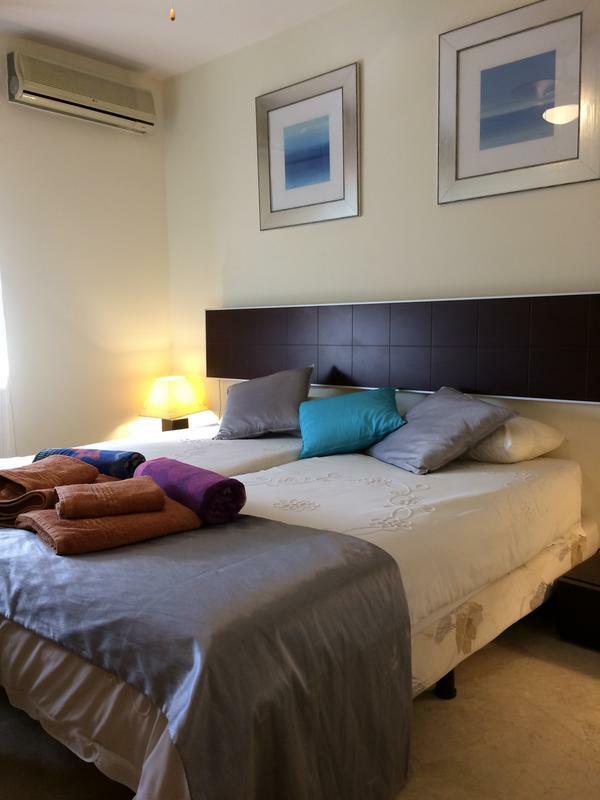 It is uniquely fitted with central heating and Air-conditioning making it a great year round choice. Upon entering the front door the living – dining room oozes style and quality.The kitchen is well appointed with all equipment necessary for a family holiday. The living room opens onto the terrace via sliding glass doors, there are also glass curtains at this section of terrace so you may choose to keep these closed in cooler months.The terrace is a long one which bends around the outside of the apartment until it reaches the living room where it is wider and where there are al-fresco dining facilities and views to the sea through the SKOL building. 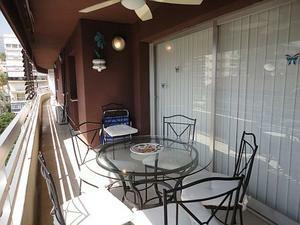 The apartment is on the outer side of the complex and has mountain and a small sea view. One can observe the town hustle and bustle yet be private and not overlooked. 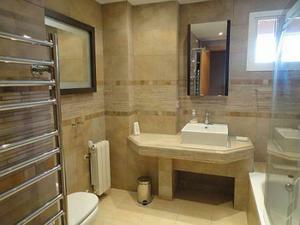 All bedrooms are double glazed and two of the three bedrooms share a lovely bathroom. 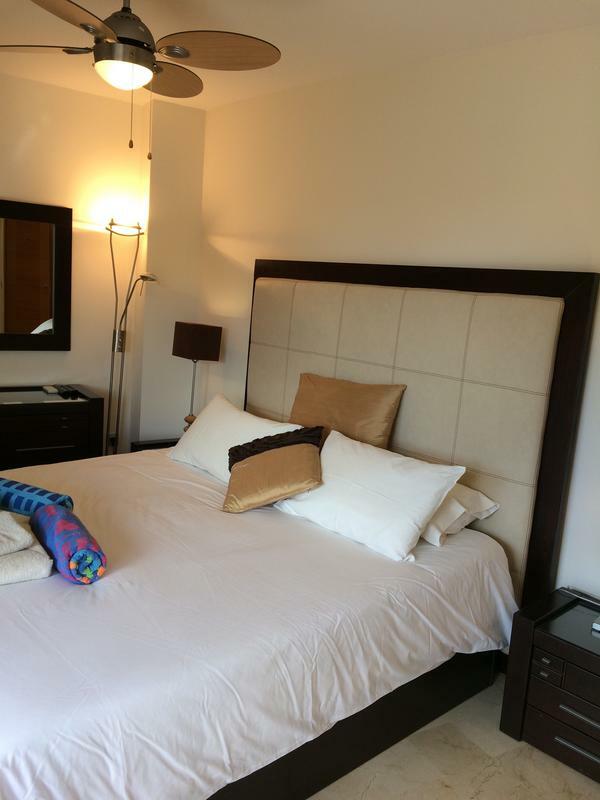 Each bedroom has individual AC units super ceiling fans and radiators. 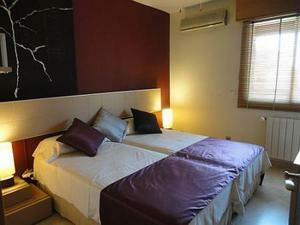 The beds can be used as singles or as ‘king’ sized beds. The colour schemes and decoration is superb. At the end of the bedroom corridor is the master ‘suite’ which has a bathroom, wardrobe area and a large bedroom, which opens onto the terrace. There are two large pools and a kiddie one also. (Please note: There are no sun beds provided around the pool so one must take chairs from the property and remove them in the evenings). 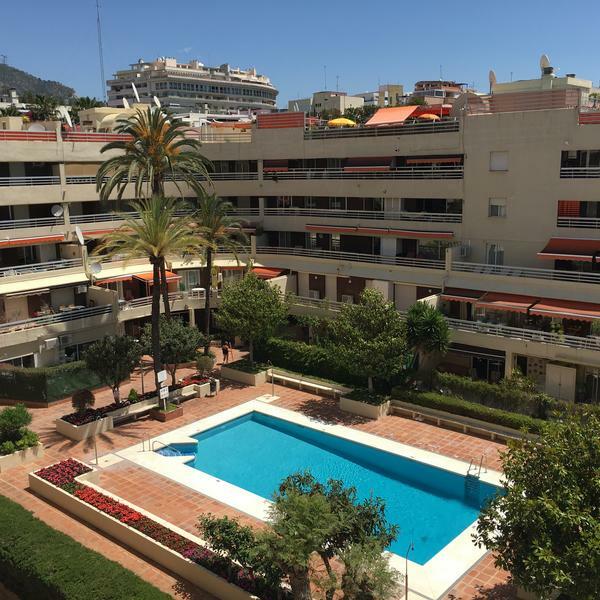 There is a taxi rank directly opposite the complex and within a short walk there is the wonderful and extremely popular Old Town of Marbella with its quaint streets, super trendy shops and a fabulous number of restaurants from which to choose. The fantastic promenade, with all the colourful characters strolling, riding, skating and posing, is also within a short stroll. The ‘buzzy’ Port of Marbella is a few minutes walk away and has some super new bars and cafes plus a great night life scene. 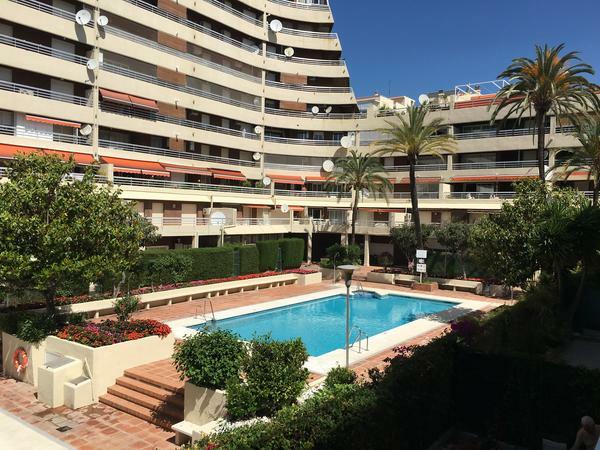 *Easter, Christmas , New year and Half term 1250&euro; As Parque Marbella is so conveniently located, many clients feel there is no need for a car during their holiday. For this reason the cost of parking is not included in the rental amount. Underground, secure parking is available upon request; please ask for a quote when booking. A damage deposit of 30% of the total rental figure to a minimum of 500€ is taken and refunded and taken after your return, normally within 7-10 days of your departure from the property,after taking into account any excessive cleaning costs or damages. 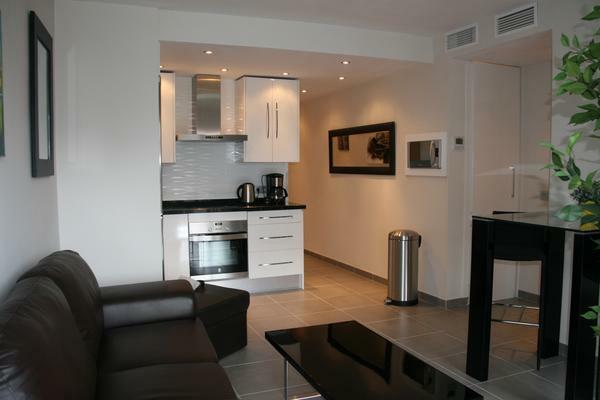 Delightful, compact 2 bedroom apartment in the heart of Marbella town.Newly renovated throughout in contemporary style. 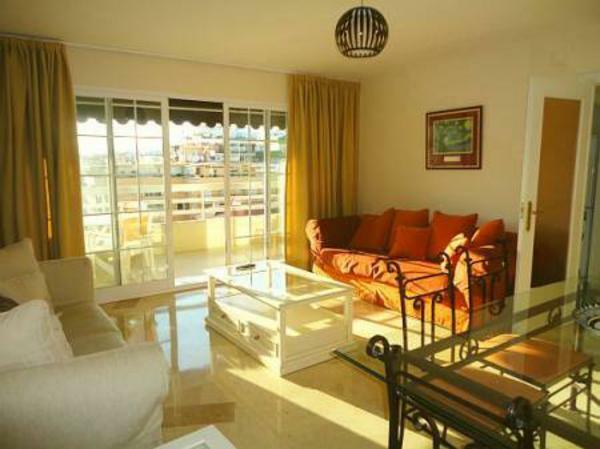 Parque Marbella is close to the beach, Ports , old town and all central Marbella has to offer. 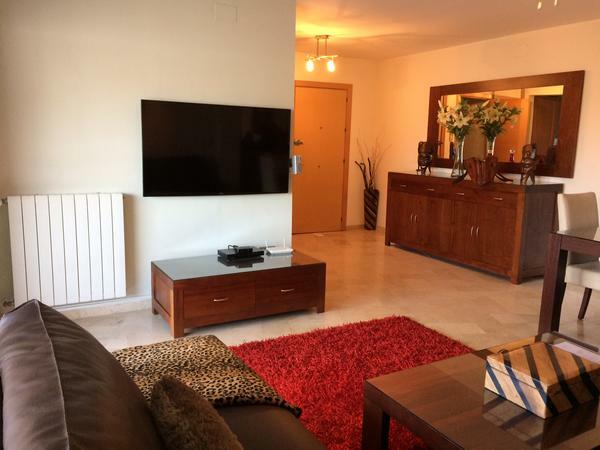 A three bed, two bath delightfully bright and spacious apartment, nestled in the heart of Marbella, close to the beach, promenade, many shops, bars & restaurants plus a lovely park. An opportunity to rent a really comfortable apartment, which is located in the heart of Marbella town yet near to the beach, the superb Marbella Promenade and which is surrounded by restaurants, bars, night life and also the lovely and lively Marina.